Excellent cityscape capture with great colors and tones. Wonderful mood and pleasure to view! :) This picture breaks out of the Cliché "Sunset over cityscape", it's a breath of fresh air. Most unique of it's kind i've seen in a while. Great job!! Beautiful color and composition. A great shot of Manhattan. Stunning colors and mood of the big city! One of the beast cityscapes I have ever seen ! This is a totally stunning composition. Ok, the lighting in this picture looks very strange. Never in my entire life have I ever seen a lighting situation like that, but I have to say it looks very cool. How did you do it? What type of filters or computer enhancements did you use? Very creative. All the elements are here for this perfect shot, The sky, the two sunlit buildings, the boat with a red stripe, pier 17, and the reflections in the water. All come together to create a moody scene with impact. congrats. Wow - just a awesome shot! Great lightning. I like it... :) Regards. Absolutely stunning!! Best shot of Manhattan I have ever seen. I am adding this to my favorites. Magic light. A composition very nice with a wonderful gold tone, it's remember the end of worm warking day. wonderful capture and composition with great tones..
WOW! Fabulous image! Awesome color and composition! Excellent, I've just added to my windows desktop collection. It will brighten up my day. Absolutely stunning picture. I'm curious about whether you used any special filtration or Photoshop work to create this. Great composition, atmospher and lights. Congrats for your portfolio. Good work. Regards. Beautiful! I love the deep colours and the sky. The reflections in the buildings are great too. 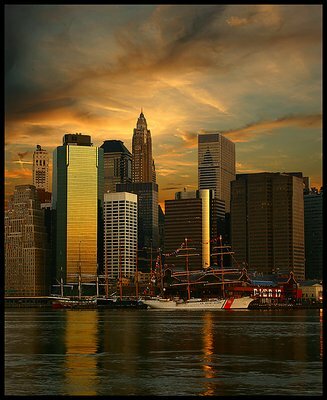 This is the most beautiful view and picture of New York,I`ve ever seen.congrats for the main. Another very good 'STAFF CHOICE' especially with 'that' sky ... CONGRATS! Can't get much better than this... Excellent! I was in Manhattan some days ago! Most excellent capturing the sunset and reflections. Perfect reflections and overall composition. Dear Bogdan, this is a fantastic mood - congratulation for this outstanding composition. Great work. Delightful and outstanding composition! I can't add anything but...Great! So dark and dreary. Good capture. The colours are awesome. Incredible .... beautiful photograph .. Bravo Bogdan ..... a masterpiece of light .. form .. and color. I love this image. Being "in the right place at the right time" is usually a lot more skill and planning than it is luck, and I think this is not a lucky shot at all. Congrats on an incredible image. Awesome composition. Light is perfect. "Right place at the right time!!!" Great sky, beautifully framed. Wonderful reflections on the glass and metal surfaces of the newer buildings, nicely complemented by the older buildings.